It looks like Ikea have got a new chair in their comfort seating line, one heavily influenced by the George RR Martin fantasy books and the much anticipated HBO TV series, which is, I suspect, going to do for fantasy what HBO did to the cop show with The Wire, you feel me? 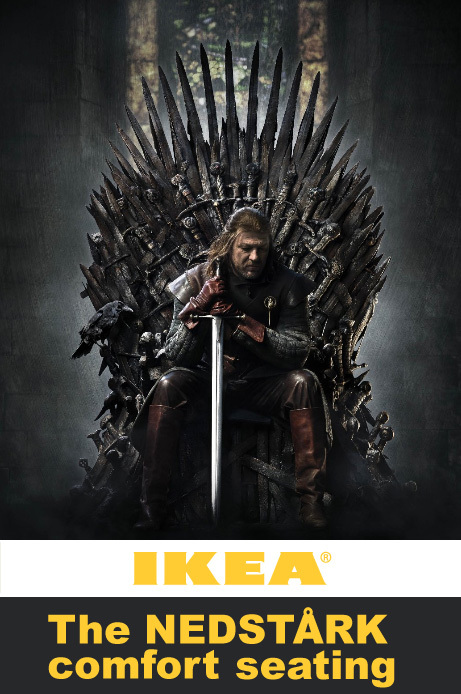 Not sure how comfortable the iron throne is going to be to sit on, mind, but I think there should be space in the living room for every fantasy and science fiction fan to have their own NEDSTÅRK to read Secrets of the Fire Sea on. File under: ‘Silly pictures doing the rounds of e-mail’.